Android Honeycomb 3.0 new features | It-11 Audio / Tonegeek"
This is the screen of Android 3.0 Honeycomb for tablet computers. It is slightly different compared to Android as we know. 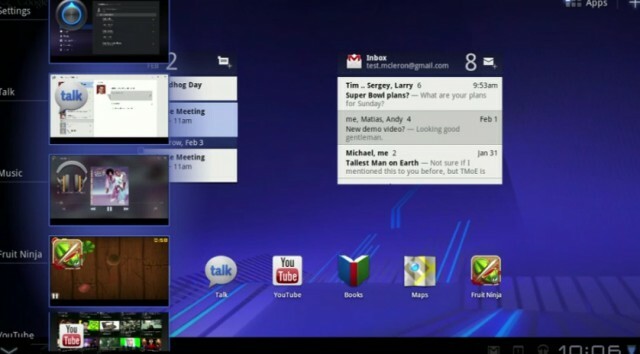 The 3.0 version fills the screen and offers a multi-tasking and improved widgets. Notifications have also been improved. Developers can use these upgrades via the API and use sounds, icons and music to manifest itself. The current apps run normally on the tablets but Gmail has a version specifically developed for the tablets. In terms of media features: Honeycomb has a new cam application. It is richer in features that the application of current camera of Android, and runs on phones and tablets. Android Honeycomb 3.0 also includes video chat. You can now view the catalog of apps from the web, but also automatically install on your phone. When you make a purchase, you can choose the devices where you want it to be installed. Try now for yourself on market.android.com. This entry was posted in What's up, doc ? and tagged Android Honeycomb 3.0, features, google. Bookmark the permalink.